….Iain Heath’s “Tastes like Zebra”! The contest was grueling and the entries were hysterical. The judges were judgmental and the winner loathes minifigs. All in all, it was a great contest! Congratulations to Iain and many thanks to all who entered. It really was a lot fun to watch and it was the easiest contest I’ve ran in many years. 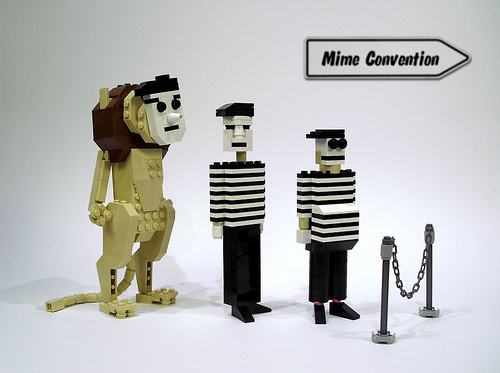 Mime On! Yay! Great contest. I’ll sheepishly admit I pretty much decided to bag it after I saw this one, however. It still makes me chuckle.